As I stare impassively out of the window, across the winter rain lashed gardens and roofs towards the white peak flecked Thames Estuary beyond, I have but one thought in my tiny little brain…. 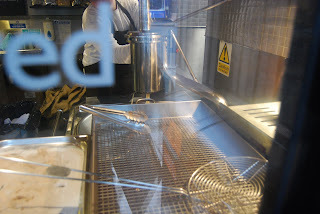 and that thought bizarrely is Churros. Yes, Churros are on my mind, which for the more uncouth among you (who me?) could also be termed “Spanish Doughnuts”…. These crunchy star shaped sticks are incredibly popular in Espana, where they are quite often dipped in Chocolate and are basically superb. Now, tuck this little nugget of information away in the back of your mind. If you’re ever in the Kings Cross/St Pancras area, just a couple of minutes down the road is the British Library. Approach the little, 'blink and you’ll miss it' Peyton & Byrne café window on the corner…. press your eager little face to the glass and behold the wonders of the churro machine beyond… hot oil bubbles and an oversized nautilus’esque wheel is evident which, when magically manipulated by the operator squeezes out perfectly ridged shaped sticks of churro, (in an admittedly faintly obscene manner) into the molten oil…there to be briefly fried and from then to be plucked and tossed with a dusting of sugar, or perhaps cinnamon, if preferred. 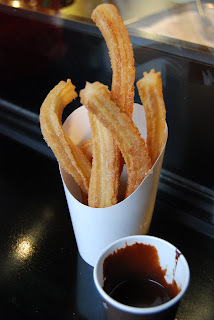 Eat your churros instantly, whilst still scorching hot – (they don’t taste the same once cooled), dipping them into the little pot of hot chocolate provided…. there’s a little shelf just outside the café perfectly placed to facilitate this task. Yours for the ridiculously small price of couple of quid, a small piece of sunny Spain, to be devoured in defiance of the grey, endless, gloom of this grim British winter. Fantastic.